10.2 megapixel Nikon DX format CCD imaging sensor: Effectively optimized by Nikon to deliver a wide, dynamic range, producing outstanding images with high resolution and vivid detail yielding 3,872 x 2,592-pixel files. New high-resolution Nikon image-processing engine: New 12-bit image processing engine combines color independent analog pre-conditioning with improved image processing algorithms. Instant 0.18 sec. start-up with fast 80ms shutter response: With a power-up time of a mere 0.18 seconds and a shutter release time lag of only 80ms, responsiveness is extraordinary. Continuous shooting at up to 3 frames per second and up to 100 consecutive JPEG images: Fast framing rates contribute to the ability to capture moments in time instantly. Sophisticated systems throughout the D80, including high-speed buffer memory handling, fast image processing, high-speed memory card access and large system bus bandwidth help make this possible. Up to 2,700 images per battery charge: * High-efficiency power systems featuring reduced power consumption and real-time fuel gauge with Nikon's EN-EL3e lithium-ion rechargeable battery. Nikon 3D Color Matrix Metering II plus variable center-weighted and spot metering: Substantially more sophisticated than traditional multi-pattern metering systems, Nikon's 3D Color Matrix Metering II instantly and accurately evaluates brightness, color, contrast, selected focus area and subject-to-camera distance information, referencing the results against an onboard database of 30,000 scenes from actual photography. Vary the size of the center-weighted area reading and the spot meter readings correspond to 11 focusing points. In-camera image editing with retouching menu: Highly versatile in-camera editing features include: Nikon D-lighting, red-eye correction, image trimming, image overlay, monochrome black and white, sepia and cyanotype along with skylight, warm tone and custom color filter effects. Built-in Speedlight with Nikon i-TTL flash metering and two-group wireless commander: Nikon’s acclaimed i-TTL flash control evaluates flash exposure with greater precision to achieve better automatic flash balance and deliver outstanding results with SB-600, SB-800 or SB-R200 Speedlights. 2.5" LCD color monitor with 170-degree, wide-angle viewing: Playback images can be viewed easily from all angles with extraordinary color and clarity. 11-area AF system with wide-area center segment and auto-area AF functions: Nikon’s multi-CAM 1000 provides maximum flexibility and optimum performance under varied shooting situations. 11-area auto focus system features a cross-type sensor in the center, broad frame coverage, as well as class-leading low light detection and convenient AF-assist illuminator to aid in low-light conditions. New wide-area AF option gives greater compositional freedom when shooting sports and action. Seven digital vari-programs plus programmed auto with flexible program, shutter-priority auto and manual: Digital vari-programs include: auto portrait, landscape, macro, close-up, sports, night landscape and night portrait, each of which adjust for optimal results under varied conditions—automatically. Image optimization mode: Optimize color, contrast, sharpening as well as other image settings according to the type of scene or output desired. Options include: normal, softer, vivid, more vivid, portrait, custom, black and white. Large, bright 0.94x viewfinder: Optical glass viewfinder features large (0.94x) magnification making composing frames easier while overall viewfinder brightness makes low-light photography possible. Built-in slideshow function with Pictmotion: Select a range of images, pick a style and add music for beautiful picture presentations delivered directly from the D80 and viewable on either on the camera’s 2.5" LCD display or direct to your television. Effects include: slide-in, slide-out, fade-in, and fade-out. *Achieved under the following test conditions: Fully charged EN-EL3e battery; temperature of 20°C/68°F; Zoom-Nikkor AF-S DX 18-135mm f/3.5-4.5G IF-ED lens; continuous shooting mode: continuous-servo autofocus; image quality set to JPEG BASIC; image size set to Medium; shutter speed 1/250 second; shutter release pressed halfway for three seconds and focus cycled from infinity to minimum range three times with each shot; monitor turned on for five seconds after six shots and then turned off; cycle repeated once exposure meters turned off. 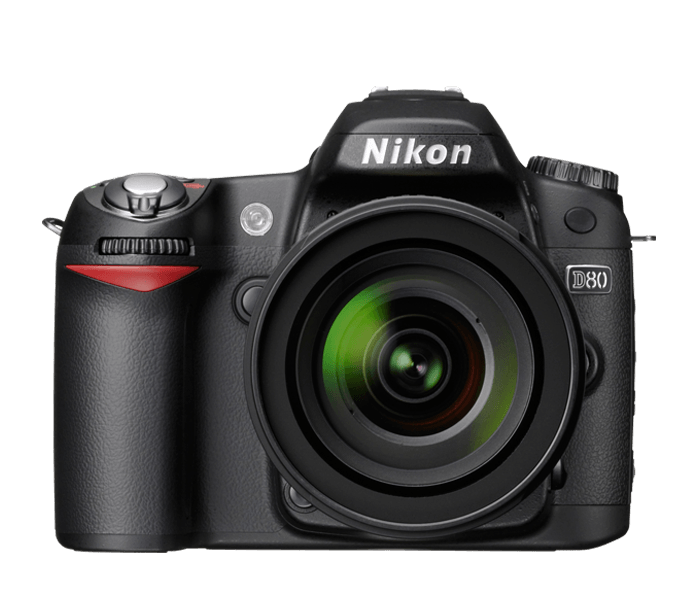 Price: ESP $899.95* D80 Digital SLR Camera Outfit includes AF-S DX Zoom-NIKKOR 18-135mm f/3.5-5.6G ED-IF Lens (Product Number 9405) Other outfits available.